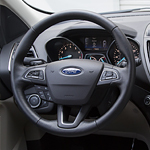 The new Ford Escape continues to be a popular crossover vehicle that is packed with technology features drivers love. Here are some of those features in action. The Ford Escape has a radar that scans the road for traffic that is getting too close to your vehicle. The Blind Spot Information System will alert the driving with a flashing light on the side mirror so the driver doesn't leave the lane and head right into traffic. The Ford Escape also has the Adaptive Cruise Control system at work. If using cruise control, when a slower vehicle is detected ahead of your vehicle, the speed is slowly reduced to avoid a collision, and once the car has moved on, then the cruise control will move back to the desired speed. If you can stop by Serramonte Ford today, we'll hand you the keys to take the Ford Escape for a test drive.